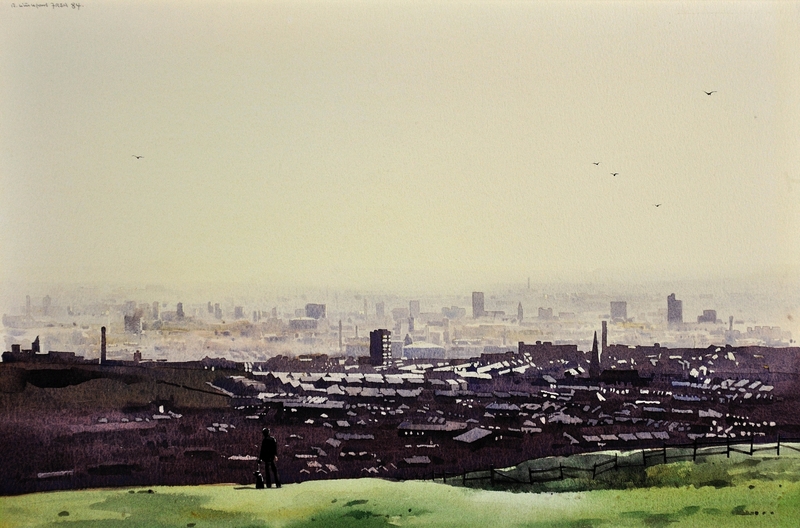 Robert Littleford - Oldham from the surrounding hills - Online gallery supplying original fine art. Trending Modern British and Contemporary Welsh. Available for sale from Big Sky Fine Art; this original painting by Robert Littleford dated 1984.<br> The watercolour is presented and supplied in a sympathetic contemporary frame, mounted using conservation materials and behind non-reflective & UV protecting glass.<br> The watercolour is signed and dated 1984 upper left.<br> <br> Robert Littleford is a contemporary British artist of humble origins whose work captures the joy and tenderness of life’s simple pleasures. <br> <br> He was born in Oldham in 1940, to parents who were both poorly paid cotton workers. After leaving school he worked as a labourer, and at the age of 21 met his future wife, Hilary. She was working as a sewing machinist, living on a farm with her father. The couple married six months later, and settled in the local village. It was Hilary who encouraged Bob to pursue his passion to paint and with her support he gave up his job as a refuse collector and became a full time artist.<br> <br> Bob was thus self-taught and the style he developed was very much his own. His delicate and tender paintings capture scenes of family life, days at the seaside and children playing; unexceptional yet very special times. His paintings are executed with a lightness of touch and brilliant use of light and shade.<br> <br> With the unstinting support of his wife, Bob achieved great success, attracting the attention of art critics and national television. His early followers included the artist Helen Bradley, and the jazz musician and broadcaster Humphrey Lyttleton. He became a Fellow of the Royal Society of Arts, and a Member of the British Watercolour Society. He has exhibited at the Royal Academy Summer Exhibition in 1973, the British Watercolour Society, Salford Municipal Art Gallery and other many provincial galleries throughout the UK. <br> <br> In the 1990s Bob suffered ill health and had to have a kidney removed. Hilary, now a mother of three, worked part time to support them. Slowly, Bob recovered and began to paint again until he was painting full time once more. His beloved wife died in 2007, and two years later, having battled with subsequent depression, Bob put on a major exhibition in Salford, which he dedicated to her. His work is now much sought after and is often sold before he has finished painting it. 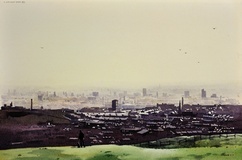 He is listed in David Buckman’s book, Artists in Britain since 1945.<br> <br> As an artist Robert Littleford is not protesting, not trying to convey a deep social meaning – he is usually presenting something beautiful, a little nostalgic and a little fun.<br> <br> This is a view of the town of Oldham in Greater Manchester, seen from the green hills above it. The town is shown as a sprawling conurbation, with rows of terraced houses and industrial brick chimneys, tower blocks and the odd church spire. The town is almost a monotone of grey, with the more distant buildings almost fading into the soft pale sky above. There is a rear view of a man and his dog, looking down on the town, no doubt contemplating his lot. Above it all are five wild birds, soaring into the sky, free from the constraints of the busy scene below. Available for sale from Big Sky Fine Art; this original painting by Robert Littleford dated 1984. The watercolour is presented and supplied in a sympathetic contemporary frame, mounted using conservation materials and behind non-reflective & UV protecting glass. The watercolour is signed and dated 1984 upper left. Robert Littleford is a contemporary British artist of humble origins whose work captures the joy and tenderness of life’s simple pleasures. He was born in Oldham in 1940, to parents who were both poorly paid cotton workers. After leaving school he worked as a labourer, and at the age of 21 met his future wife, Hilary. She was working as a sewing machinist, living on a farm with her father. The couple married six months later, and settled in the local village. It was Hilary who encouraged Bob to pursue his passion to paint and with her support he gave up his job as a refuse collector and became a full time artist. Bob was thus self-taught and the style he developed was very much his own. His delicate and tender paintings capture scenes of family life, days at the seaside and children playing; unexceptional yet very special times. His paintings are executed with a lightness of touch and brilliant use of light and shade. With the unstinting support of his wife, Bob achieved great success, attracting the attention of art critics and national television. His early followers included the artist Helen Bradley, and the jazz musician and broadcaster Humphrey Lyttleton. He became a Fellow of the Royal Society of Arts, and a Member of the British Watercolour Society. He has exhibited at the Royal Academy Summer Exhibition in 1973, the British Watercolour Society, Salford Municipal Art Gallery and other many provincial galleries throughout the UK. In the 1990s Bob suffered ill health and had to have a kidney removed. Hilary, now a mother of three, worked part time to support them. Slowly, Bob recovered and began to paint again until he was painting full time once more. His beloved wife died in 2007, and two years later, having battled with subsequent depression, Bob put on a major exhibition in Salford, which he dedicated to her. His work is now much sought after and is often sold before he has finished painting it. He is listed in David Buckman’s book, Artists in Britain since 1945. As an artist Robert Littleford is not protesting, not trying to convey a deep social meaning – he is usually presenting something beautiful, a little nostalgic and a little fun. This is a view of the town of Oldham in Greater Manchester, seen from the green hills above it. The town is shown as a sprawling conurbation, with rows of terraced houses and industrial brick chimneys, tower blocks and the odd church spire. The town is almost a monotone of grey, with the more distant buildings almost fading into the soft pale sky above. There is a rear view of a man and his dog, looking down on the town, no doubt contemplating his lot. Above it all are five wild birds, soaring into the sky, free from the constraints of the busy scene below.